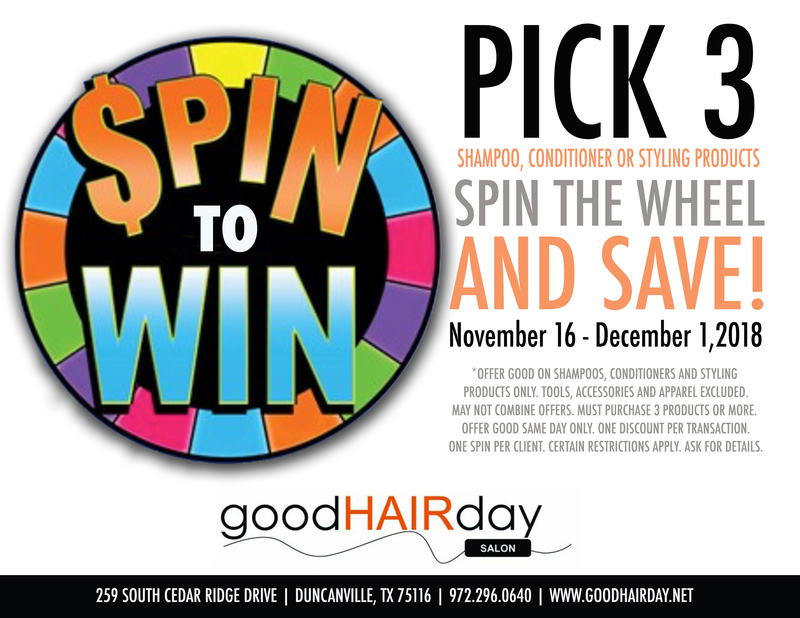 Spin To Win on Good Hair Day Salon Professional Products! Just in time for Black Friday! Here’s your chance to stock up on the professional products you need for you, your family or a gift for a friend! Everyone has a chance to Spin To Win! **OFFER GOOD ON SHAMPOOS, CONDITIONERS AND STYLING PRODUCTS ONLY. TOOLS, ACCESSORIES AND APPAREL EXCLUDED. MAY NOT COMBINE OFFERS. MUST PURCHASE 3 PRODUCTS OR MORE. OFFER GOOD SAME DAY ONLY. ONE DISCOUNT PER TRANSACTION. one spin per client. CERTAIN RESTRICTIONS APPLY. ASK FOR DETAILS.